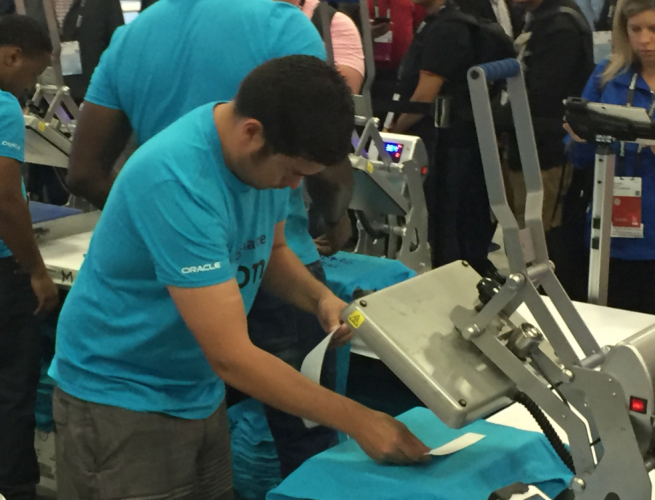 Print t-shirts live, watch as your customers line up for their complimentary branded shirt. Your customers control the creative process, picking the image, shirt color and size. Within minutes, the shirts are screen printed and hand delivered, still warm from production. Crowds gather in amazement as these personal shirts are printed in real time. Brand Immersion – Immerse your clients in your brand. Each prospect spends 10 minutes at this promotion. Your brand, your banner and this engaging experience will envelope your clients. You message will be heard and remembered. Advertising Features - Bold signage will quickly identify the proud sponsor of Print Studio. Uniformed and scripted brand ambassadors will meet and greet your guests. Each branded shirt is hand delivered with an advertising post card. Sales Data Capture – As attendees queue for service, sponsors take advantage of this idle time by collecting sales survey information or for product education. All guests must answer sales qualifying questions to participate, you create the questions, we report them.